We caught up with the busy theater and costume designer Connie Watson, to ask her some questions about her exciting career. There are so many exciting roles that you can pursue in fashion, and there are countless types of fashion designers that you’ll encounter – one of which is a theater and costume designer. These ‘crafty’ individuals are responsible for the overall look of the garments worn by actors and actresses in theater, film and television productions. Connie studied Theater Design at Nottingham Trent University and has been working as a designer and maker on theater productions. Connie has also set up her own fashion business, Watson Bags. which specialises in leather handmade bags. What does your role as a Theater and Costume Designer entail? This all depends on the job. If you are the sole Costume Designer, you would design all of the costumes – along with the input of the director and creative team – then pass them over to the making team. However, with most of the jobs I have worked on, I have designed the costumes, then acted as the manager throughout the making process, and worked backstage on the productions. My main work is theater costume designing and making, and dressing the performers. How did you become a Theater and Costume Designer? I have always loved the theater. As a child, I dreamt of the world backstage and how the magic was achieved. I thought that becoming a theater designer would be the perfect way of combining my love of theater and textiles, and therefore decided to study Theater Design at Nottingham Trent University. At University, I met the Dragon Breath Theater Company and became the wardrobe assistant on their version of Gulliver’s Travels at The Curve in Leicester. I made many connections there, including the amazing director Tim Ford, and I went on to be the costume manager on two of his shows and have more coming up. How much creative freedom do you have in theater design? It is a very creative industry. Each director is different regarding how much creative direction you have as the designer, but as a general rule, they always welcome new, fresh ideas. The most recent production that I was involved in was ‘Singing in the Rain’ at The Swan in High Wycombe. As Costume Manager I was responsible for the designing, making and sourcing of all of the costumes involved. It was a great show, and I very much look forward to working with the team again for the February show. I enjoy how different each job is. The industry allows you to meet a lot of diverse and interesting people. Each job comes with its own challenges; so you are constantly learning and developing. It is also a job that comes with few ties: you could be working anywhere at very short notice. Theater design requires such a diverse skill set, so it can be linked to many industries, which I love as it means that I can have a lot of various projects on the go, such as my small bespoke leather bag company. What has been the biggest success of your career so far? ‘Honk’ at The Curve has been my biggest success so far. 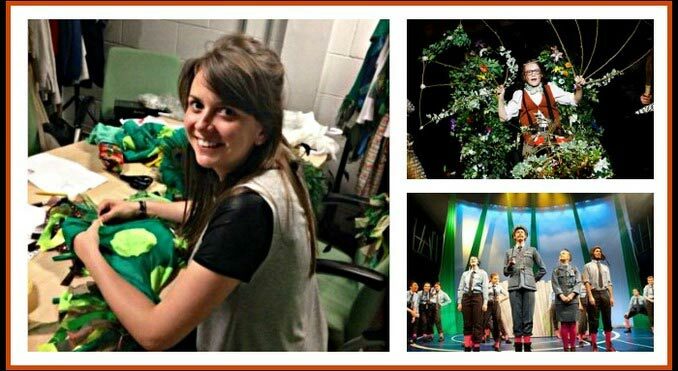 My role as Costume Manager included designing and making all of the costumes involved. This gave me a real sense of personal achievement, as seeing your personal designs become a reality on stage is a brilliant feeling. Connect with costume designer Connie Watson via her Utelier profile.